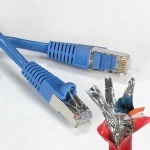 Standard Ethernet cables are completely unshielded. While that's ok for office environments, unshielded cables are not intended for use on the factory floor. This Category 6 cable is double-shielded to resist electromagnetic interference and reduce crosstalk between pairs. Each pair of #26 AWG copper conductors is wrapped in a foil shield. There is also a braided shield beneath the cable’s PVC jacket. The RJ-45 connector at each end has gold plated contacts. This cable is compatible with stationary GigE camera installations. It is TIA and EIA certified, UL and CUL listed, and RoHS compliant.